December 14, 2010. Jerry checked in with his Yankee #210. This is a 'newly found' Dolphin, our 172nd - click here to go to the updated list. January 7, 2011. Jerry has followed up with a couple of pictures and some history. Thank you for your email and adding Calmante to the roster. I bought her in Feb. 2005 from Bob and Lani Lovin and kept the name Calmante, a Portuguese name for tranquility and peacefulness. 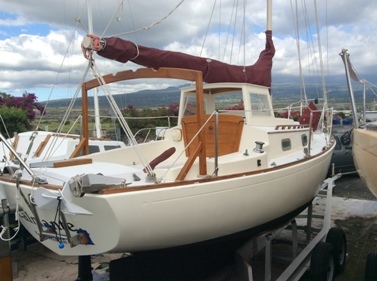 Her home port has been at Kona sailing club located at honokohau harbor on the big island of Hawaii, where she is on a trailer by the Kona sailing club, fully rigged and ready to launch and retrieve for sailing. 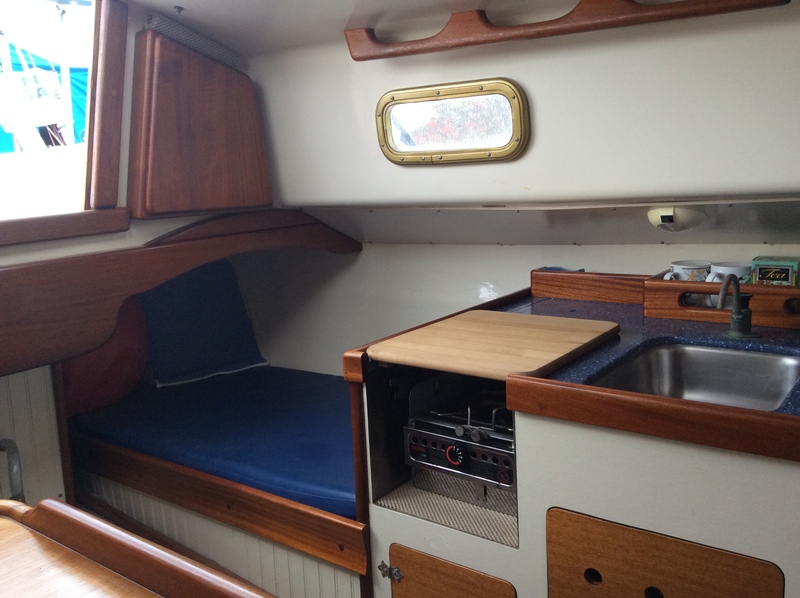 The previous owners sailed her since 1988. 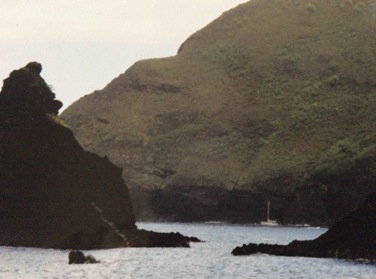 In 1988 she was owned by Carl Barlow and named Kua Koa. 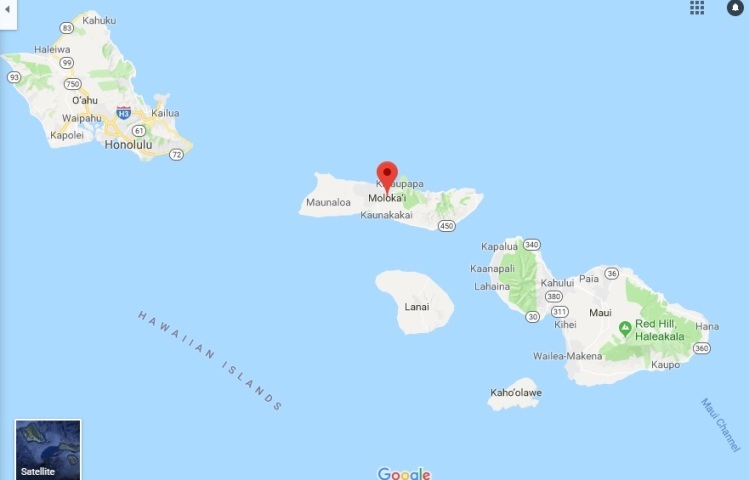 During this same year in November while visiting the Kona coast from Oahu she made the front page of the West Hawaii Today newspaper after being swept ashore and on the rocks by a passing winter storm. 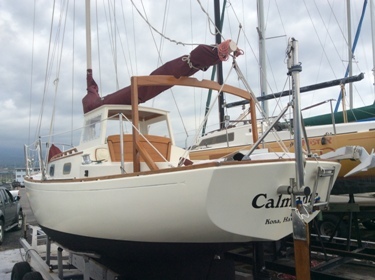 At this time new owners purchased her and changed her name to Calmante. 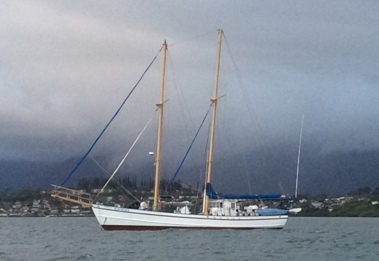 In Jan. 1991 she was swept ashore a second time from her mooring in Kailua Bay, Kona. 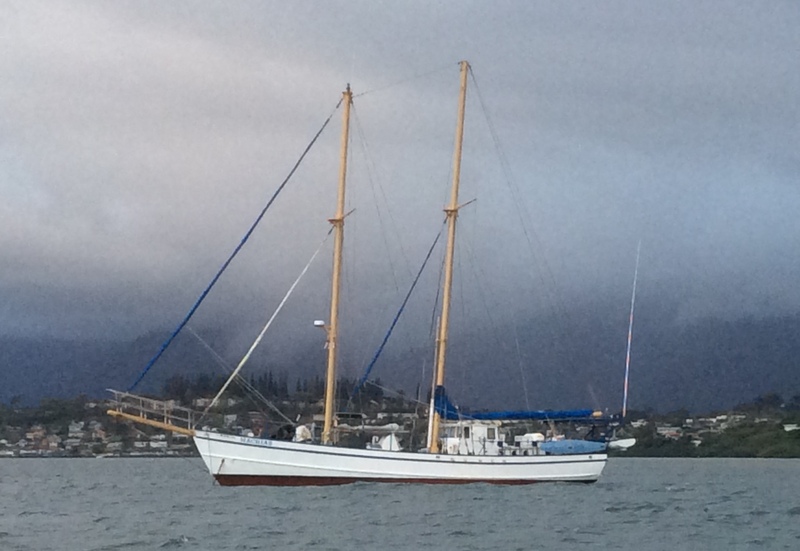 After repairs, a trailer was built and kept at the Kona Sailing Club. At this time I don't have any other history except that she was sailed to Hawaii from California. 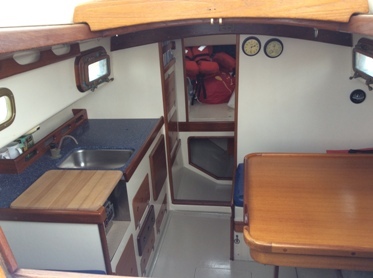 After buying Calmante in 2005 she went through a major rebuild for a year before sailing once again, turning her into a strong and comfortable compact cruiser. 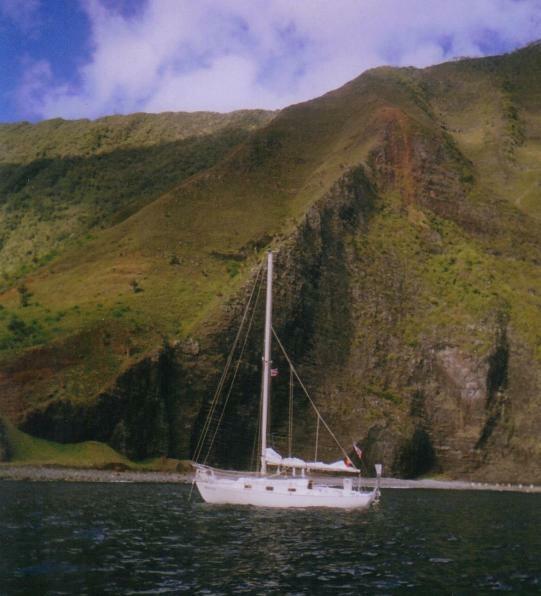 During the last couple years we've been cruising and exploring all 7 of the habitable islands of Hawaii, visiting many different areas and anchorages. 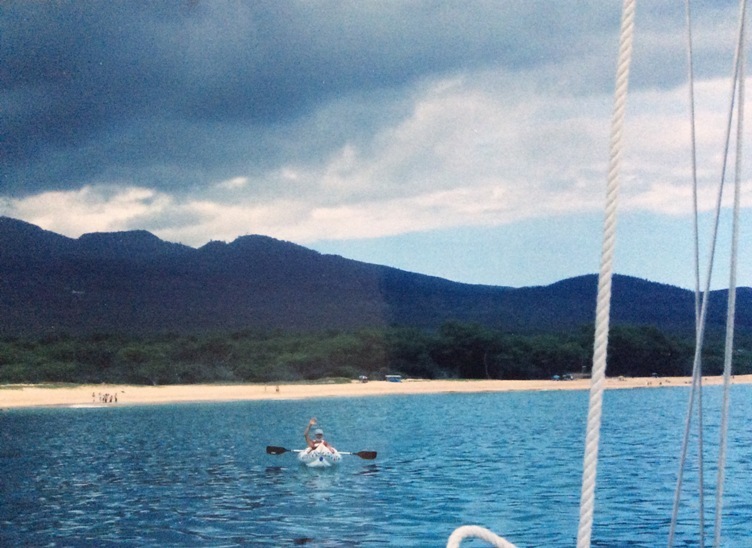 Living the cruising life in a small way has been exciting and a life long dream. Thanks again Ron for making this web site available to us. Aloha from Hawaii to all. 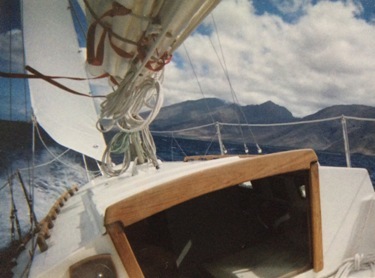 The picture of Calmante in a strong breeze was sailing from Maui to Hawaii in the Alenuihaha channel, returning to the Big Island from a cruise to all the islands.The cruise was 33 days long, visiting 22 different areas and about 800 miles round trip, using the wind vane self steering most of the time. 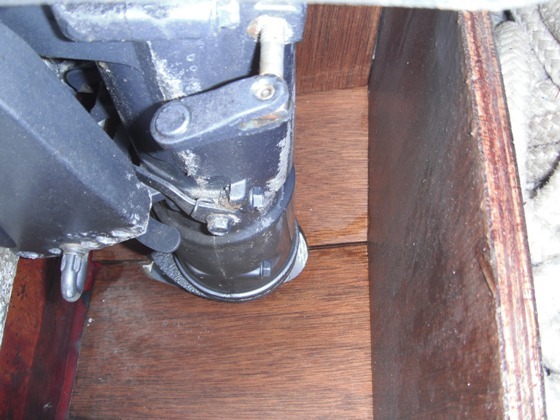 I have a 4 hp long shaft outboard in the motor well and I enclosed the shaft with half inch marine plywood, keeping the water out when in a rough sea. Just recently I built a sea hood and hard dodger for the sliding companionway hatch to keep water from entering that area. 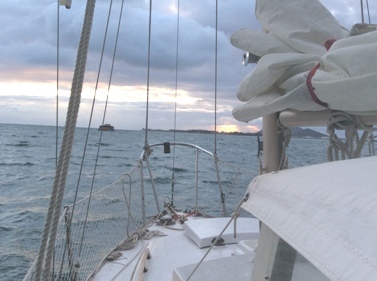 I love sailing these islands not only for their beauty but also for the challenging conditions of trade wind sailing. 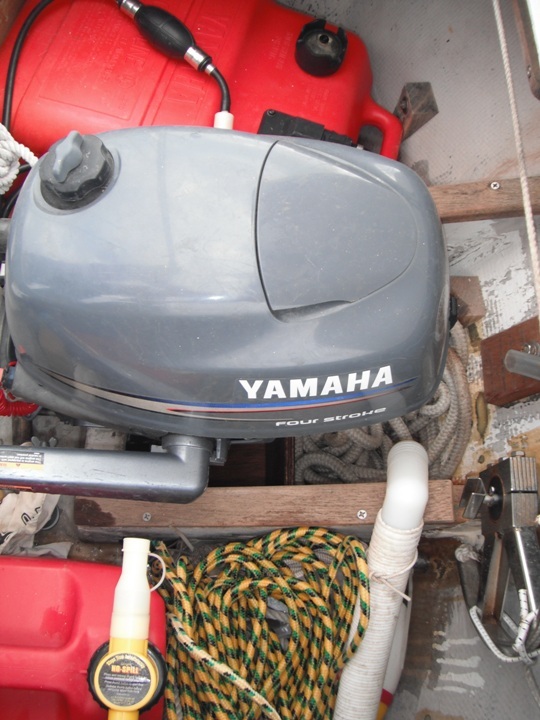 Calmante has a 4 hp, 4 stroke Yamaha ob and it exhausts in the interior of the well. So I crack the hatch open a few inches to give the motor a little more air to breeth when running. 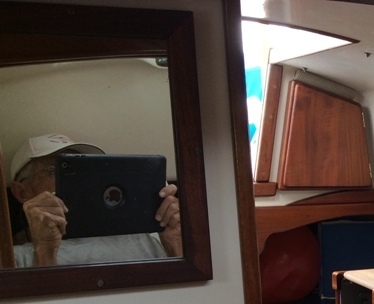 I do enjoy single handing most of the time but also like to share the sailing experience with others. 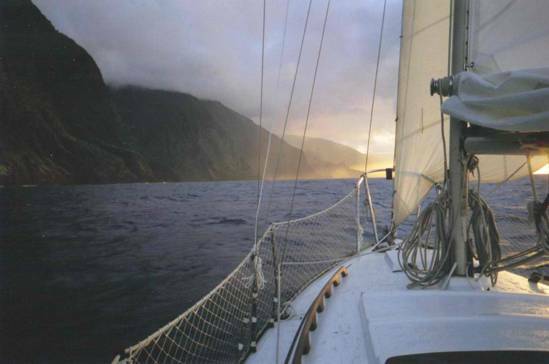 The last picture sent was off the north east coast of Moloka'i, broad reaching with 80% working jib. 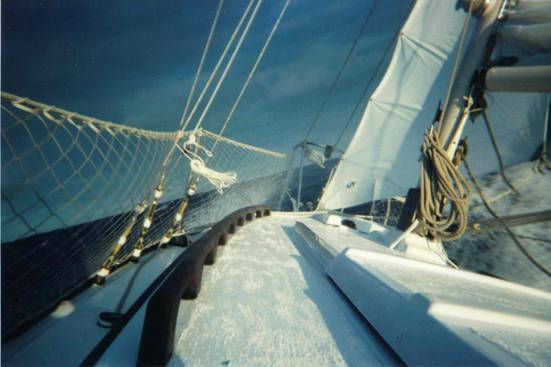 The first picture, sailing from Maui to Big Island, a small storm jib and third reef in main works well. The plywood used in the bottom of the motor well to keep the water out is in 2 pieces with a hole for the motor. Inside the well there's 3 pieces of plywood holding the wood around the motor in place. All the pieces fit together without using any fastners so all can be removed easily. All the best you Ron. February 10, 2011. Jerry sent in an email and photos of Calmante's transom well set up that prevents water from surging up and into the well. 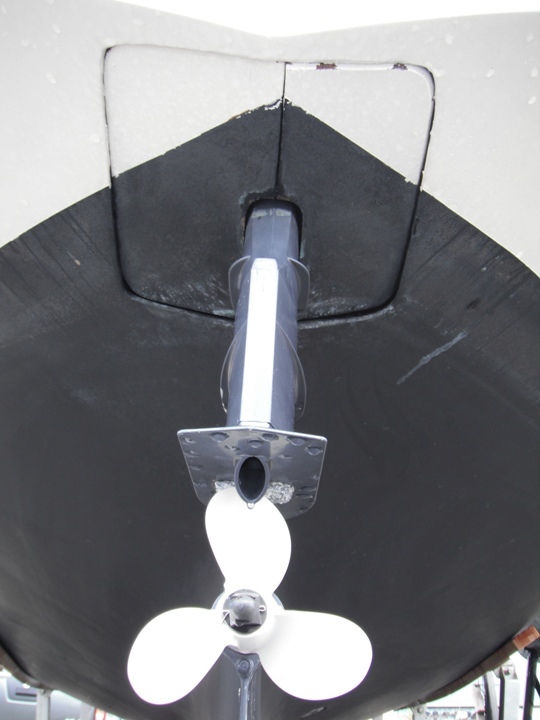 We include these here and also in the Technical Section/Transom Plugs and Wells. Here are the pictures of the bottom motor well enclosed by half inch marine ply, cut in half through the hole for the motor shaft. Inside the well are two pieces of ply on the sides and one piece just aft of the motor shaft held in place by line stuffed in between the inside stern and the center ply. On the top rail of the motor well, 1x2 is secured with screws and overlaps to the inside of the well by 3 quarter inch. The overlap holds the sides and center piece ply down on the ply, covering the motor well opening. Before installing this arrangement lots of water would splash up into the storage area and make it to the inside of the hull requireing lots of pumping to keep the bilge dry. 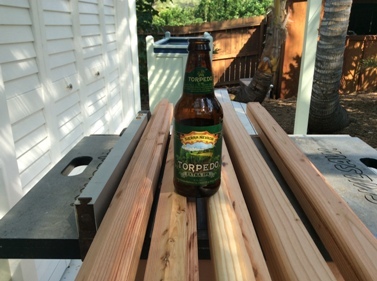 All the plywood fits together without fastners and can be taken apart easily for motor removal. I'll close for now Ron. December 2, 2014. In recent days we have reconnected with Jerry. The following email exchange and pictures show he has been busy - edited. I would like to have access to Forum for more information on his build and installation of his center board. Would also like to become a member of the Dolphin 24 website. 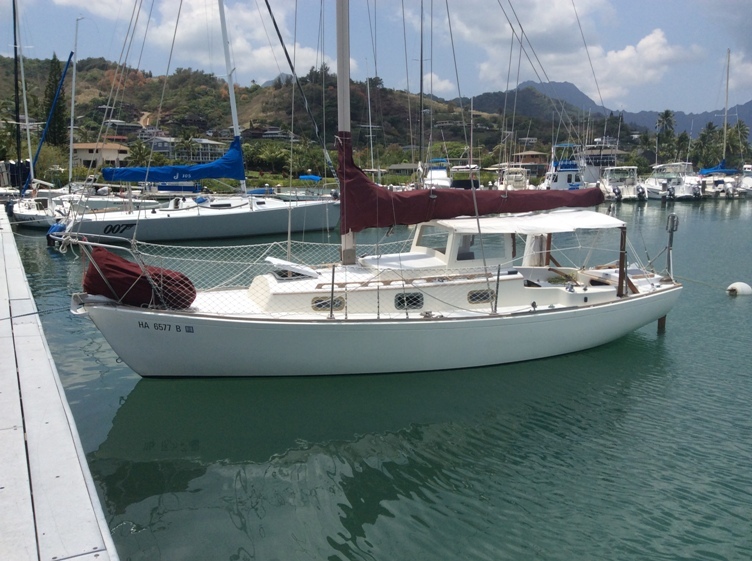 Cruising around in the Pacific in a Dolphin 24 without using the centerboard is old news - have you read about the adventures of Kiwi, Yankee #107? Click on this link to check her out http://dolphin24.org/kiwi_tahiti.html. Thank you for all the great links and sailing without the centerboard down. All very interesting reading. Also I was grateful to see that you used the stern picture of Calmante (above) to show the stern ladder. This ladder being compact in the stowed position also extends through a slide putting two steps into the water when folded down. Since the taking of that picture I've added a hard dodger and 'garage' over the companionway and sliding hatch. Also added a boom gallows and a Bimini awning that can be tied in from pilot house to the boom gallows. The additions have greatly added to the comfort and safety in cruising these Islands in a small boat. ps That blue Dolphin 24 is still here in Kona and has a slip at Honokohau marina. I'll check it out and see what he's been up to. 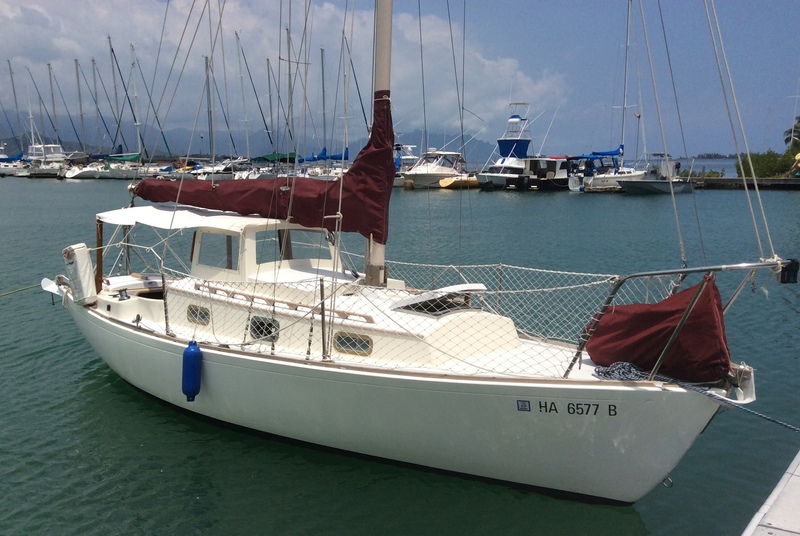 I have recently purchase Dorado from Brent Lievsay and am going to ship it to Hawaii just after the first of the year. I want to thank you for all the information that I have gleaned from the website and hope to reciprocate in the future by contributing as I restore Dorado. 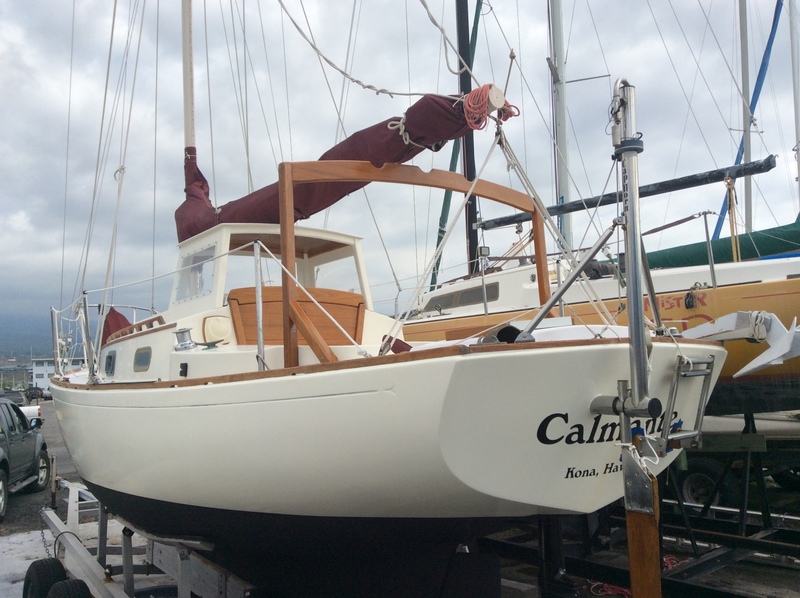 I was on the big island of Hawaii looking at another boat and came across Calmanti and instantly fell in love. To make a long story short, I found Dorado for sale on the Internet and closed the deal with just a series of photographs. I am hoping the restoration isn't too major but I built boats for a living back in the 1970's and 80's and am up to the task, I hope. More later. Thank you for your email. Excited that John is new owner of Doredo. I can advise him on some of the upgrades he's interested in. Have John send me his email address. I've been doing well here in Hawaii . My family and I going through some life changing experiences. Last cruised the islands in May and plan on a cruise this June 2017. Continue to love sailing these islands. Also continue to love Calmante, my Yankee Dolphin, and always making improvements. I'll send you some photos - see below. 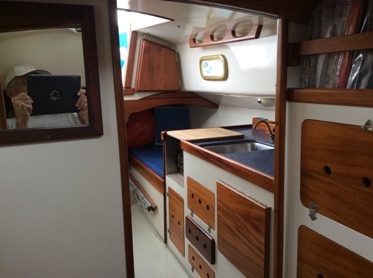 Great to hear from you and also of John Cahill's purchase of a Dolphin 24. Merry Christmas and Happy New Year to you and family. Been thinking of rigging my Dolphin as a cutter. Would you have any information on this for a Dolphin 24? Gerald Horan. 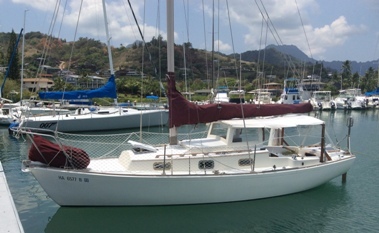 Dolphin 24 Calmante, Kona Hawaii. Thank you for your email. Calmante is doing well. Last year installed a new compass which I can see a lot better. Also added a round port on the front side of the cabin house. 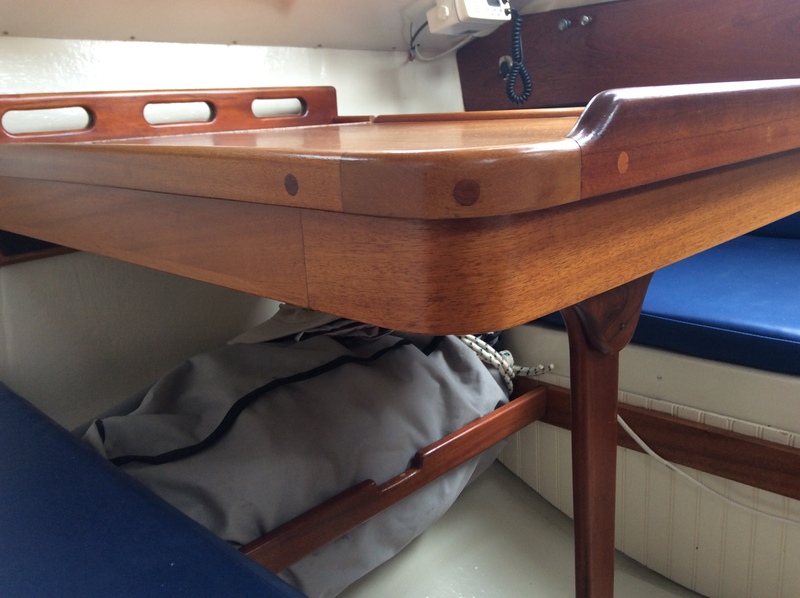 I have a new ss centerboard that needs to be installed. 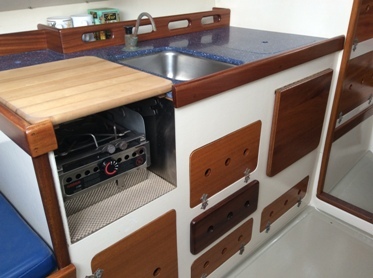 I will do it myself but still need to make up the vertical lifts and strap, the system that you have shared with us to lift the Dolphin off the trailer (http://dolphin24.org/no_travel_lift.html). Been sailing without a centerboard for 3 years and need to get the new one installed. My last Island Cruise was in June and will be going again soon around the same time. Will send some photos. Aloha Ron. Thanks again for keeping in touch. All the best to you and the family. Postscript #1: The following - Anchored out in Kane Ohe Bay, Oahu. Always enjoy anchoring close to pretty boats! 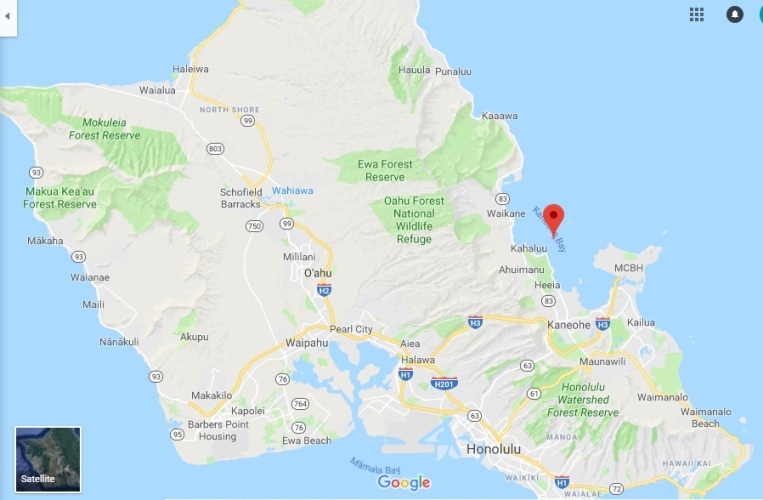 So, where is Kane Ohe Bay, Oahu? Website staff asked Google Earth.